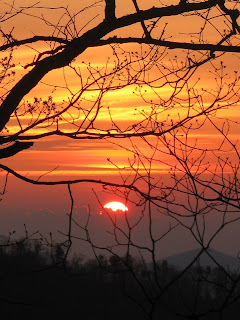 Today (Friday, March 30th) I hiked from mile 20 down to mile 9, as measured from the southern terminus of the Appalachian Trail. Tomorrow should finish the deal. For a change, let's try looking at today's hike mile-by-mile. 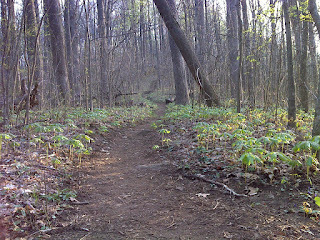 Mile 20 to 19: Nice level side-hill trail headed south out of Woody Gap. And fortunately the side of the hill I was on was facing east, so I got this nice sunrise photo. Mile 19 to 18: Reaching Jack's Gap (with a private house in view through the trees just to the west) the trail makes two fairly sharp climbs to the tops of two knobs, both of which have nice views from their rocky summits. 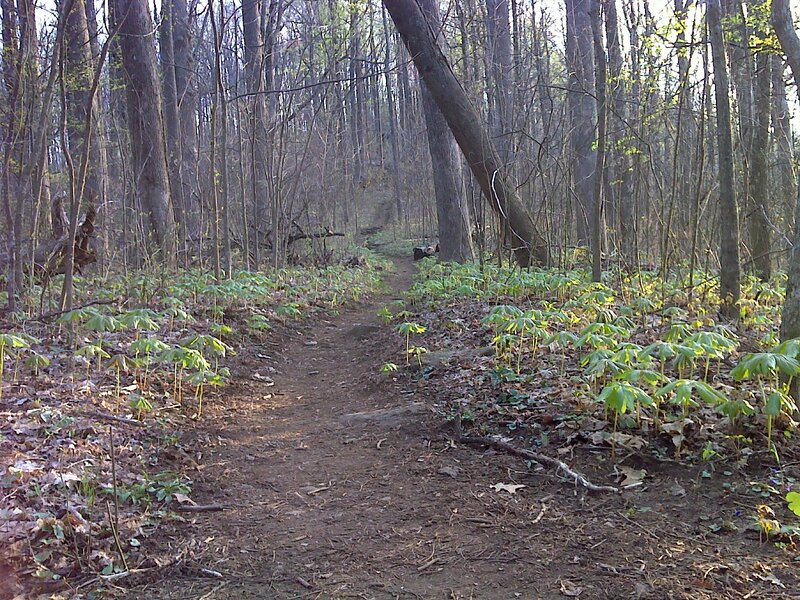 Mile 18 to 17: Pass through Liss Gap where the trail meanders through a solid growth of Mayapple - yes Mayapple is already up in March! It was another near-summer-like morning. 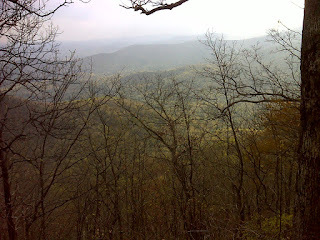 Mile 16 to 15: Begins with a sharp climb south out of Gooch Gap. Then the trail levels off, reaching a side spur ridge on which the nice Gooch Mountain Shelter is located. Mile 15 to 14: Descend fairly gradually and cross Blackwell Creek on nicely placed stepping stones, then the trail undulates a little, but stays at about the same elevation. 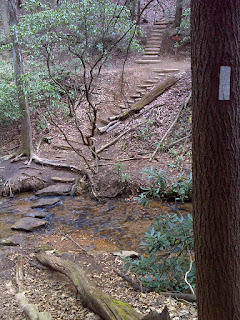 Mile 14 to 13: Cross Justis Creek with elaborate trail log step-work, and then begin the significant ascent toward Justis Mountain (the first strenuous part of today's southbound leg). 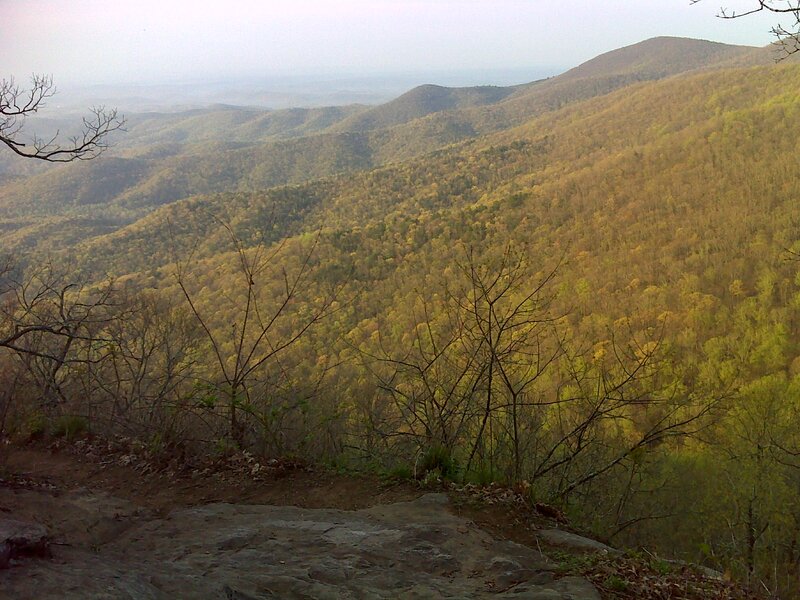 Mile 13 to 12: Reach the summit of Justis Mountain after crossing a secondary summit. There's just a bit of a winter view from the top of Justis Mountain - hardly does it Justice. 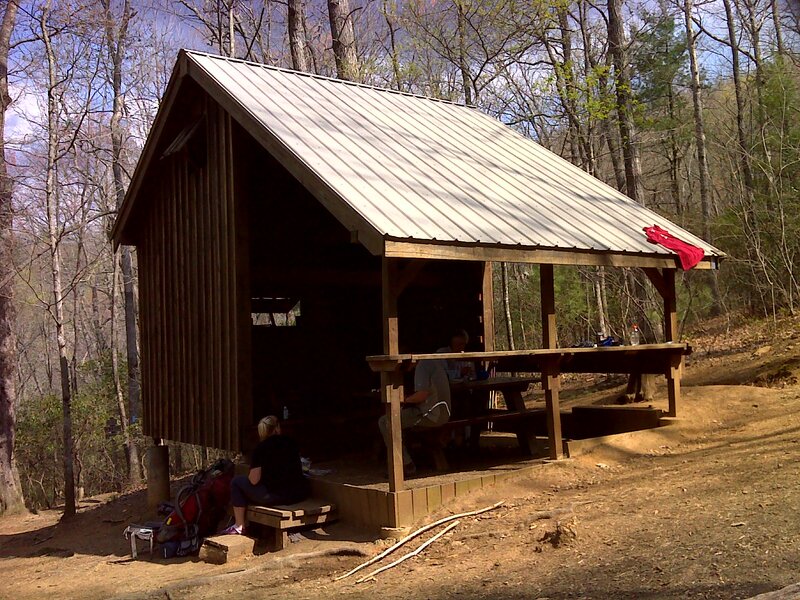 Mile 12 to 11: Descend off Justis Mountain past a cute rock overhang that people have camped under, and would serve as an emergency shelter. Reach Cooper Gap where the AT once again crosses FS 42 and where there's another parking lot photo-op. Flat gravel just ain't photogenic though. 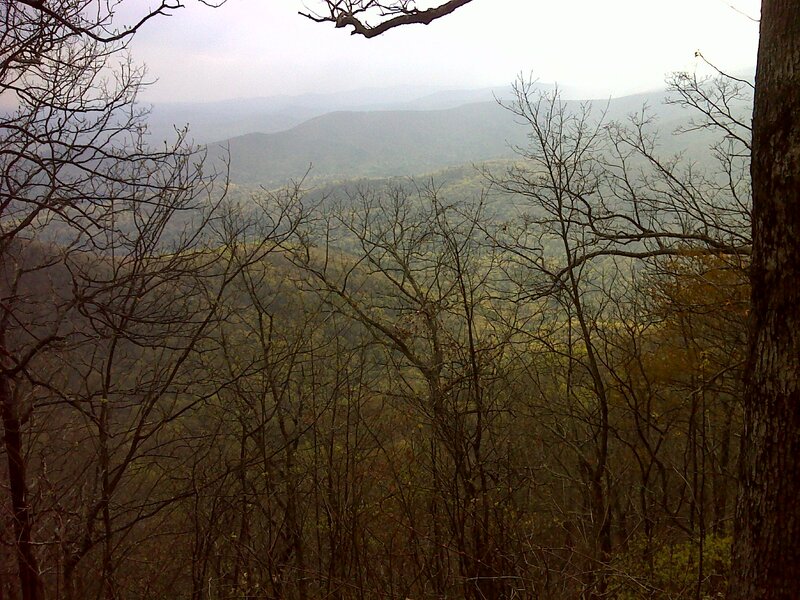 Then comes the most significant climb of the southbound leg: From Cooper Gap up Sassafras Mountain, with limited view right at Mile 11, and right near the summit. 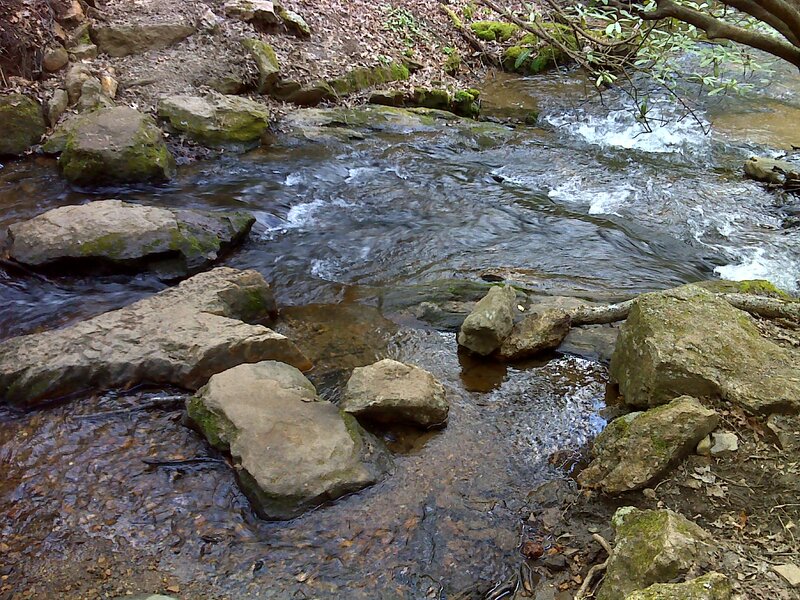 Mile 11 to 10: This entire mile involves the 600 foot descent from Sassafras Mountain to Horse Gap. Returning northbound this is the most strenuous climb of my day - it's steep enough to get your heart rate going. 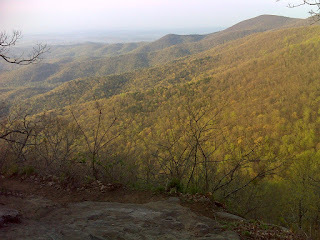 Mile 10 to 9: The steepest climb of the southbound day is the 300 foot climb up to the ridge from Horse Gap. 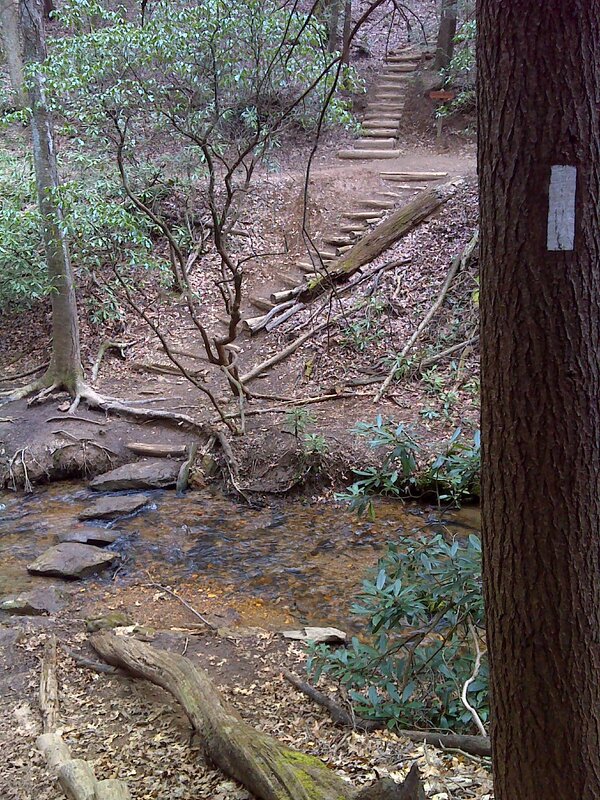 Then the trail undulates, coming within view of FS 42 again twice including passing a parking and camping area 0.6 miles south of Horse Gap with a 25 yard access trail to the AT. Finish with a steep little climb to a summit with no name and almost no view - almost qualifies as a PUD (pointless up-and-down) except that there is a half decent campsite near the precipice with decent winter views at least. Here's where I turned around.